BATON ROUGE — Moreau Physical Therapy is currently performing Trigger Point Dry Needling and having successful patient outcomes. TDN is a treatment for muscular tightness and spasm which commonly follows injuries and often accompanies the degenerative processes. This muscular tightness and spasm will cause compression and irritation of the nerves exiting the spine. When the nerves are irritated, they cause a protective spasm of all the muscles to which they are connected. This may cause peripheral diagnoses, such as carpel tunnel, tendonitis, osteoarthritis, decreased mobility, and chronic pain. Small, thin needles are inserted in muscles that contain the trigger points that are referring pain. The muscles then contract and release, improving flexibility of the muscle and decreasing symptoms. The patient may only feel a cramping sensation locally or they may feel similar symptoms for which they are seeking treatment. TDN results in deactivating the trigger point, reducing pain, and restoring normal length and function of the involved muscle. Typically, positive results are apparent within two to four treatment sessions, but this can vary depending on the cause and duration of the symptoms and the overall health of the patient. 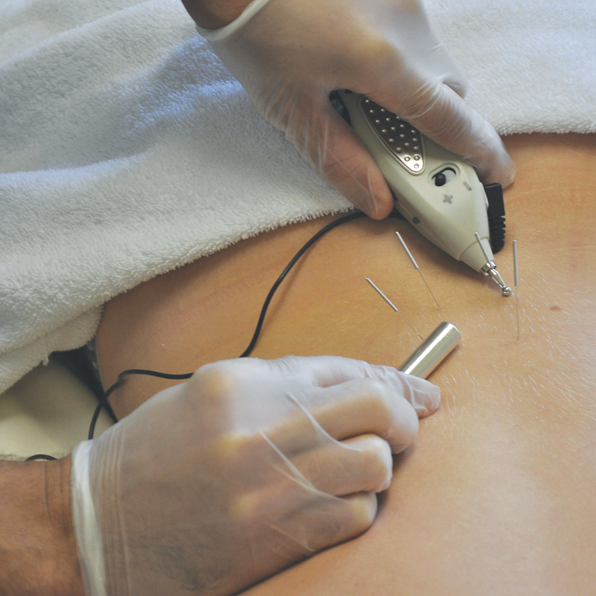 Common diagnoses that are treated with dry needling include sports-related injuries, muscle strains and spasms, chronic pain, fibromyalgia, back/neck pain, and headaches. Trigger point dry needling is used in conjunction with other physical therapy interventions to achieve successful outcomes. For more information or to set up your appointment, go to the Moreau Physical Therapy website at www.moreauPT.com.